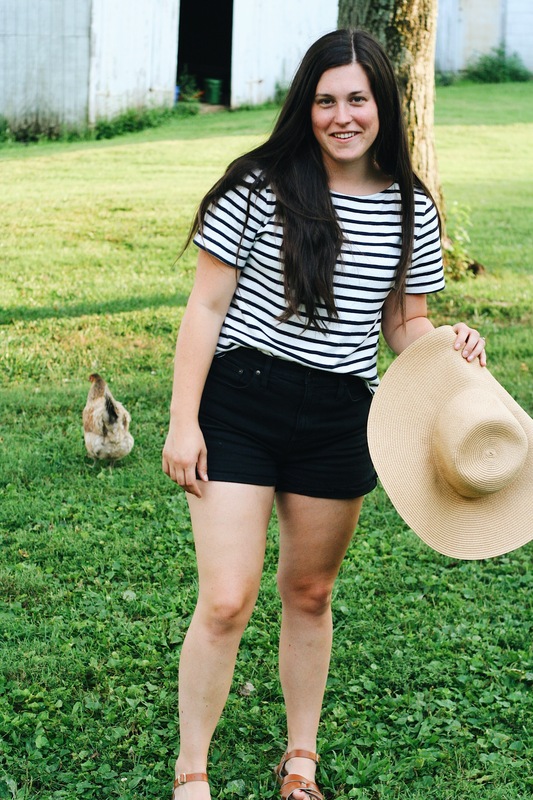 After checking out their website and their story I decided to give two of their (made in the USA) tee’s a try: the Ella Short Sleeve Top and the Leif Slub Tee. I’ve been wearing them each a couple times a week four a little over four months so I thought now would be a good time to write a review about both. First Impression | SO happy when I opened the box (bag? can’t remember…) on this one. Met or exceeded expectations right off the bat. Fit | A cropped, slightly boxy top that still totally feels feminine. I have broad shoulders and hips and sometimes this fit can just make me feel broad, ya know? I think the wider boatneck-like neckline helps achieve that balance. The shoulder seam hits right at the top of the shoulder, which again isn’t always the case for me in any regular fit tee. The longer sleeve length is amazing and really brings home that french inspired and tailored feel For reference I am wearing a size large, which is my typical size. Feel | Sturdy, heavier weight 100% organic cotton, it really does just feel good against the skin. More than that, it does not stretch or bag out in areas (underarms, torso, etc. ), even after multiple wears. There are no concerning stitches that seem un-cared for or threatening to come undone. It truly feels high quality. Fuss Factor | No fuss really with this one. It’s cotton, so it’s easy to wash and easy to upkeep. I just throw it in the washer on cold + delicate (as I do with most of my clothes), give it a little reshaping when it comes out and then hang it to dry. The cropped length threw me for a loop at first (even though it was a cropped length I was after), but I just hadn’t had really an experience pairing that length top with any kind of bottom. Fortunately I have a love affair with high-waisted pants so that fuss resolved itself real quick. Flexibility | The cut, pattern and weight of this top all lend it to be extremely versatile in my opinion. I could just as easily wear this top to the office as I could to a playground play date. It doesn’t feel precious, but its tailored feel make it feel slightly more precious (to me) than some of my other t-shirts. 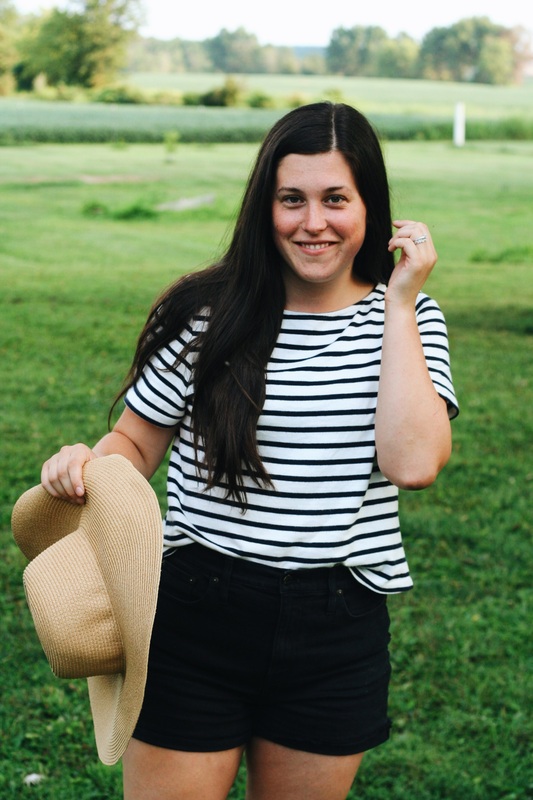 ELLA SHORT SLEEVE TOP by Amour Vert (made responsibly) / Also available at Nordstrom – currently out of stock in this color, but available in more colors! We’re still in the swing stages of fall here in Ohio; last weekend it didn’t get above 72 (with lows in the high 40’s) but this week we’re looking at highs in the 80’s again. So shorts and sandals some days, ankle boots and jeans others. As you might suspect, I’m already thinking of ways to wear this tee and make it feel a little more like fall. 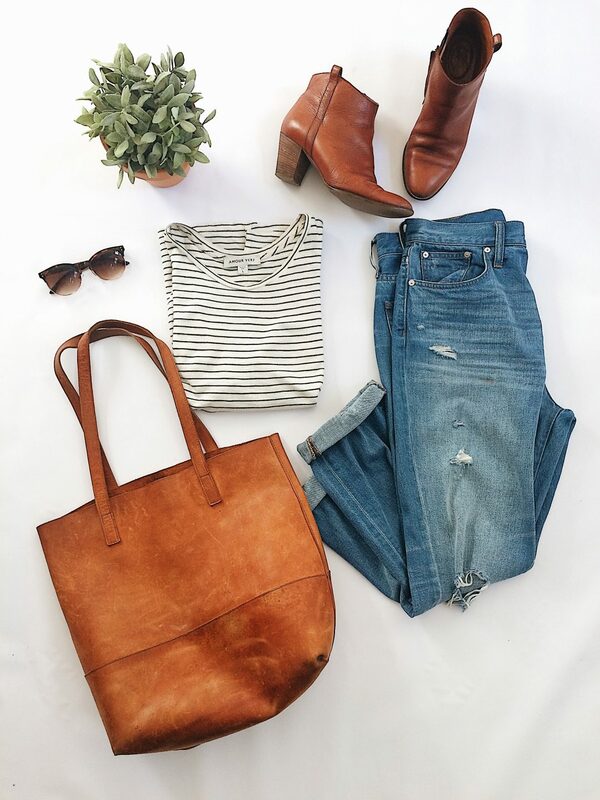 Pairing it with faded black denim, dark brown booties, a matching bag, and some tortoise shell shades (to marry the brown and black mix), like I’ve done below, is at the top of my list. First Impression | Again, SO happy when I opened the box on this one. Met or exceeded expectations right off the bat. Fit | The fit of this tee is totally like a basic tee — but the kind that feels like so much more. Ya know what I mean? 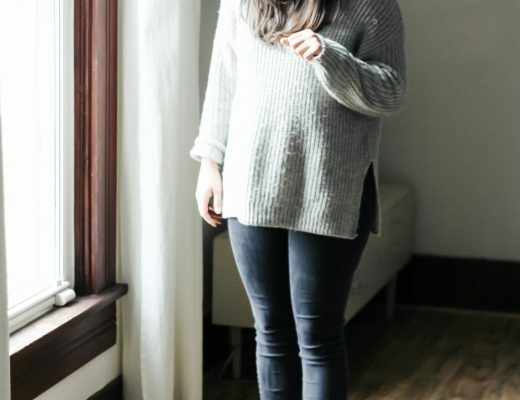 For me, it’s in every last detail: the slightly lowered crewneck, the subtle drape away from one’s midriff, the sleeve width that allows for actual biceps, the sleeve length that is short but not obnoxious and the split hem detail (which you totally can’t appreciate because I have my shirt tucked in…). I as continue down a path of ‘wardrobe reflection’ I am increasingly convinced that fit is #1. Feel | This tee is also 100% organic cotton, but a much lighter weight. In fact I would say so much so that it kinda feels feathery and buttery when you put it on… Glorious, no? 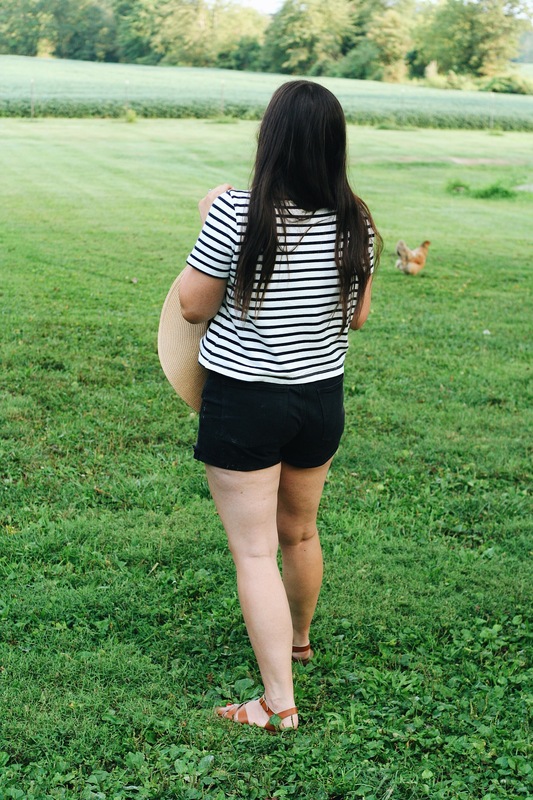 I love it because as much as it’s necessary to wear tank tops in the hotter months I’ve learned I just don’t feel as good when I wear them, nor are they as versatile once the colder months roll around. Finding tee shirts that are breezy enough to act as a tank top has been one way I’ve been attempting to resolve this. Fuss Factor | Although I’m hard pressed to call this shirt ‘fussy’ in anyway, I would be remiss if I didn’t mention that is does have a tendency to loose some of it’s shape after a full day’s wear. I’m not sure if it’s because of the thinness of the fabric or because I am subject to toddler pulls all day long, but at the end of the day the underarms and the midriff area both feel slightly stretched out from where they began the day. It in no way inhibits me wearing it and still reach for it over and over and over, but I have distinctly remarked on this on several occasions and wanted to include it here in my review in case you too are considering it. To clean, I also just throw this tee in the washer on cold + delicate (as I do with most of my clothes), give it a little reshaping when it comes out and then hang it to dry. Despite it’s thin weight I have not had any tiny little holes show up, which has been a concern in the past for me. Flexibility | Same as the Ella Short Sleeve Top, the cut, pattern and weight of this top all lend it to be extremely versatile. I could just as easily wear this top to the office as I could to a playground play date. It doesn’t feel precious, but its tailored feel make it feel slightly more precious (to me) than some of my other t-shirts. Big news: I recently purchased my first pair of non-skinny jeans, the first in like over TEN YEARS?! Haha! Sorry, that just sounded so dramatic… but it did feel kind of intimidating! Just to be clear, I have absolutely nothing against skinny jeans. 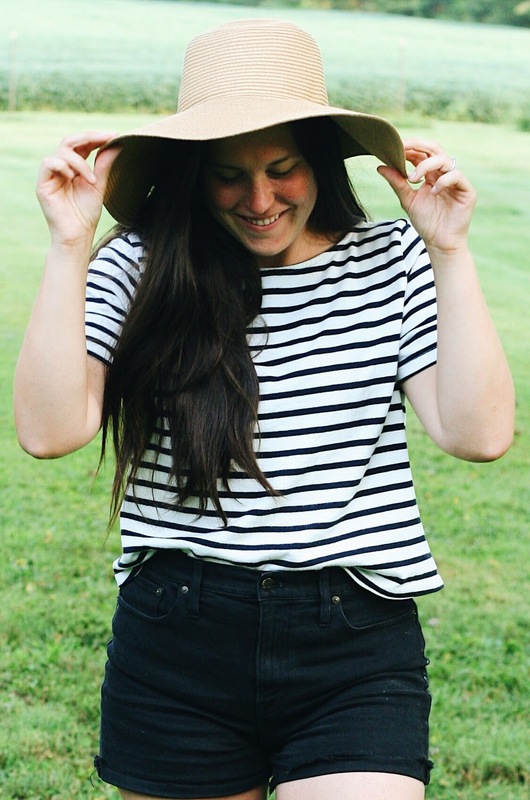 In fact in the clothing world they may just be my best friend (especially if they have a rockin’ high waist). But, awhile back, I expressed the desire to experiment a little more with silhouettes since I really only know two (fitted on bottom and top vs. fitted on the bottom and volume on top). 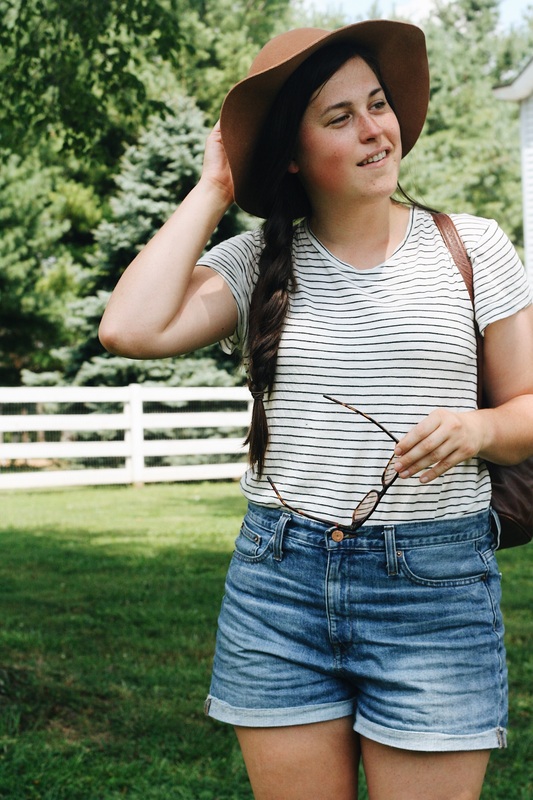 I started searching and reading and heard great things about the perfect vintage jean from Madewell. I scoured reviews on sizing, scoured some more on my go-to secondhand sites and scored the pair you see below. I’m still experimenting but have been pleasantly surprised with the looks I’ve been able to put together — this one (below ) being one of my favorite thus far. 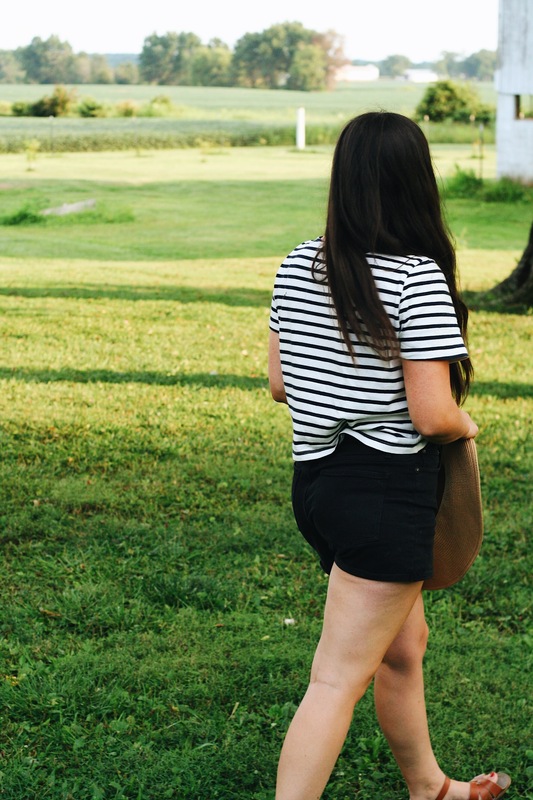 All I do is tuck a semi-fitted (or fitted) t-shirt into these high-waisted ‘mom jeans’ (gotta love that term), put on pair of ankle boots that have a little heel to them and call it a day. And I mean c’mon, I definitely look like a cooler version of myself, but still feel like myself. Total win. Side note: I have sort of developed a process of ‘shopping my closet’ after purchasing a new piece and did so after buying these jeans. 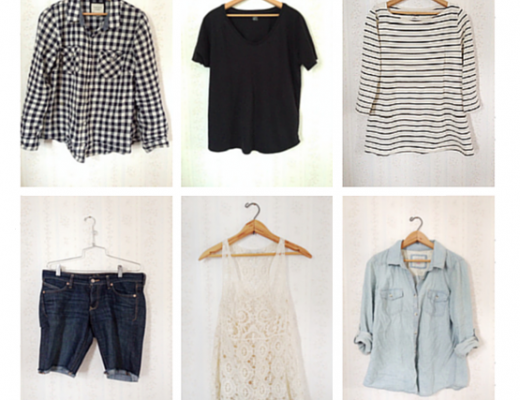 Would you be interested in me putting together something like a: ‘How to Shop Your Own Closet’ guide? Where I go over the semi-structured process I now follow? Have you heard of Amour Vert before this review? What are your thoughts and/or experiences? I personally have been excited by the emergence of a sustainable clothing brand with a more European and/or romantic aesthetic, how about you? This post is not a sponsored post. I personally purchased both Amour Vert pieces discussed in this post and conducted this review entirely apart from Amour Vert. This post does contain affiliate links. Great post! I’ve recently seen this brand on Nordstrom’s site and I love the style of their clothes. Thank you for your review! 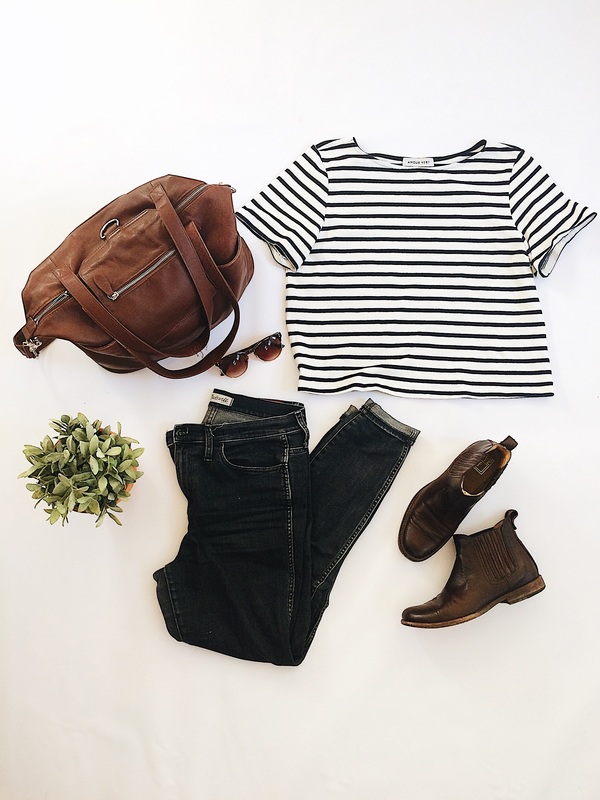 How do you like your Frye Chelsea boots? I see some on EBay that I might pick up. They offer returns but with a restocking fee :( so I want to do my research before buying! Short story: I love them. Best boots I’ve ever owned. Long story: I finally get why people are willing to pay so much money for them brand new. (Even though I still just can’t! Lol) They are beautiful and dressy but you can wear them to the pumpkin patch and get them muddy and not even worry! The leather is so much more high quality than most other leather boots I’ve owned. They are the best of both worlds. I’d read that they run small before I bought my pair second hand, so I sized up half a size. They fit more narrow and are very snug on my feet. At first I worried that this would make my feet hurt, but they didn’t. In fact they are the most comfortable, supportive boot I own as well! The only downside I see to them is that I can’t wear my super thick wool socks with them in the winter, just a normal weight thinner sock. Hope this helps!! Well that’s good to hear! Now if I can only figure out sizing issues. A half size bigger for me is 10.5 which is really hard to find. 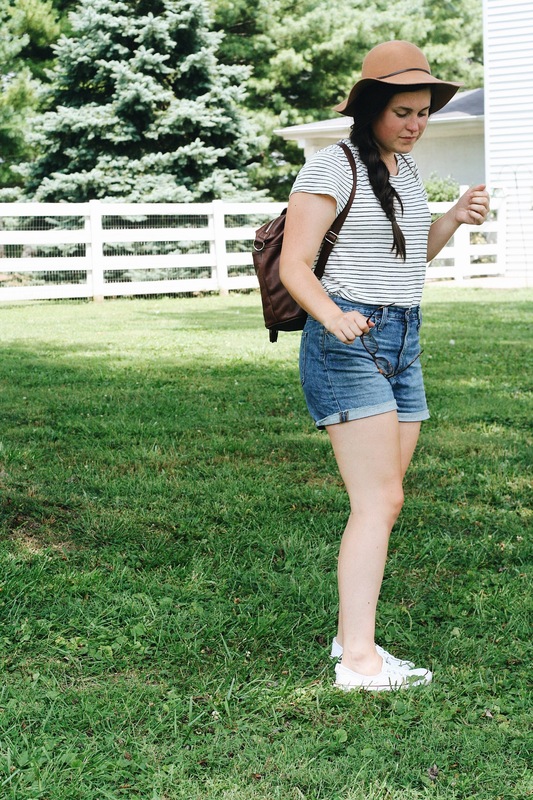 FYI: The shoes are available in men’s on the Frye website on final sale for a great price ($119!) but they don’t do returns or exchanges on final sale items. I love your blog! 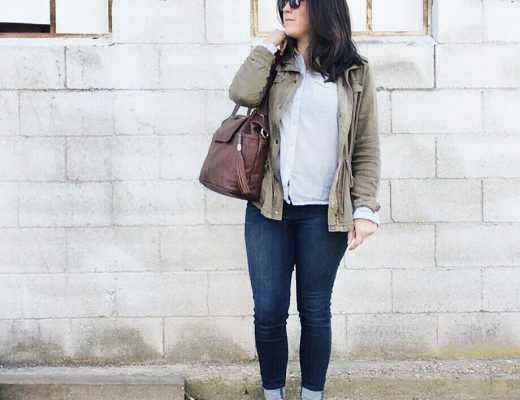 Reading about your lovely life has left me feeling inspired to continue my journey towards curating a workable yet stylish capsule wardrobe for myself (and husband and kiddos). FYI, I’d love to see a “shop your own closet” piece! I love Amour Vert! I also appreciate its French/European aesthetic–so many sustainable/ethical clothing lines in the past have looked (to me) like clothes straight out of Woodstock (which, while great on others, it’s not my style). It’s nice that in the past few years more companies have sprung up with options that don’t look so “hippie.” These tees look great on you and I love your styling! Fun and effortless, while still practical. I have a long-sleeved, drapey tee from Amour Vert, and I just got the Columbe tee dress from them. I have worn the hell out of the tee over the winter and it still wears just as beautifully as the day I got it. I expect I’ll think the same of the dress. You can just tell that the quality is there, which is why I think it’s worth the higher price tag.